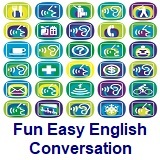 ﻿ Fun Easy English - new classroom free online classes english language lessons speaking listening writing reading april 26. 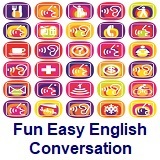 Today in the Fun Easy English classroom you are going to learn about direct objects an important part of English grammar. Definition of a direct object. 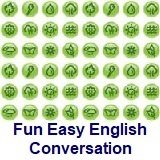 then ask a question about the verb using "whom" or "what"
Example: The teacher ate lunch. the question would be: The teacher ate what? The student read the book. She likes to eat cookies. Direct objects are actually pretty easy to learn. Read the examples above. Stan: What time does the bus leave for the airport? Harry: I don’t know. It used to leave every half hour, but I think the schedule’s been changed. Stan: Do you know the telephone number to call? Harry: It’s Enterprise 7­4700. At least that’s what it used to be. Stan: Yeah, I’ll try it. (Pause) They don’t seem to answer. Harry: I expect that it’s a little too early. I don’t think they open until nine o’clock. NOTE: On most telephones in the U.S., letters appear with each number on the keypad. When those letters are combined, we often use easy to remember words of names in place of the letter combinations. In this example, the letters are EN which correspond to the numbers 3 and 6. So the number here is 367­4700. The use of only numbers has become more common today.